By @SimonCocking. Latest book on the great potential of IoT to help humanity by Standford’s Dr Timothy Chou, who we recently featured here. You can buy the book from Amazon here. Precision technology powering an Internet of Things has the potential to reshape the planet. Timothy Chou has created Precision to introduce the basics of the Internet of Things (IoT) for the enterprise. The first part Precision: Principles and Practices discusses the framework’s fundamental principles and these principles put into practice. 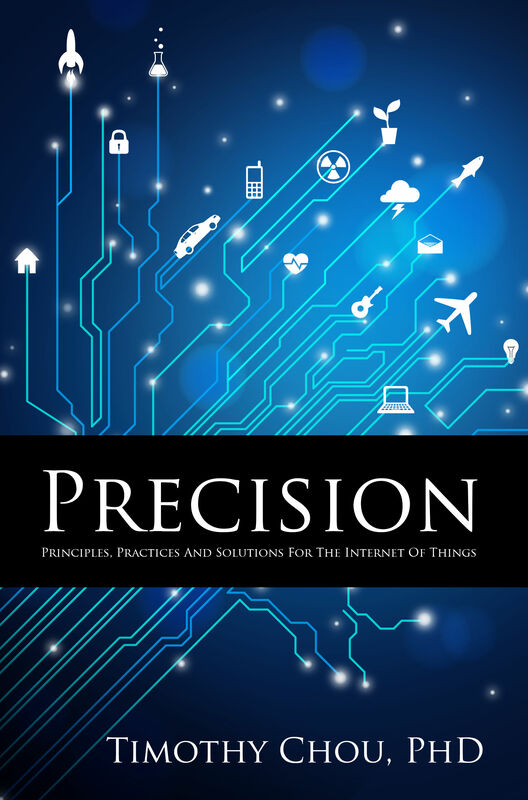 The second part Precision: Solutions puts Chou’s IoT framework into practice highlighting 12 real world solutions for manufacturers who are building precision machines and companies utilizing these machines to receive precision enhanced business outcomes. Case studies discussed span a number of industries such as power, water, healthcare, transportation, oil and gas, construction, agriculture, gene sequencers and mining. This is a good book that aims to deliver a sober hype free look at the potential of the IoT to assess how it could actually help to deliver value to our lives and the world around us. As many companies throw out increasingly large numbers in terms of the number of potentially connected devices Chou aims to put this into a meaningful context. His frame work for this is to place all devices into a five layer hierarchy of potential uses: DO, LEARN, COLLECT, CONNECT, THINGS. With this outline he then works through various industries and the potential implications of IoT data insights. As he explains “things can tell you much more than people and can talk constantly” (p52). In more and more areas the potential for human error versus the higher levels of machine powered efficiency suggests that we will see more industries widely impacted by an increase in the levels of technological competence combined with a falling cost of sensors. As this comes to pass, it will make increasing economic sense, and for higher safety levels, to use IoT capabilities. Chou’s examples include wind turbines, trains, construction equipment, oil, gas, and health devices. All of which would benefit from increased levels of precision and with this also accuracy and pinpointed interventions. Health in particular offers a lot of exciting potential improvements for personally tailored improvements, specifically created for each individual patient. The book is actually a relatively short read and perhaps could have gone into more detail in some of the examples given. However as a book that aims to deconstruct some much of the recent IoT hype to deliver clear, carefully explained examples of where IoT will and already is making a difference, then this book fills a useful niche. As a lecturer at Stanford you can imagine that this book could well become an IoT 101 primer to introduce people to the field. Next up it would be interesting to then read a sequel that expands on many of the ideas introduced here.